How It’s Irish: All of the films are Irish or Irish-American, ditto the music. The Festival was conceived over a few pints! Some films, like Parked, starring Colm Meany, are prize winners in Irish Film Festivals. The Craic Festival runs from March 8- 10.
the High Art Festival – and it’s always a party. “Hope” and “Optimism” are words Terence Mulligan keeps returning to as he describes this year’s Craic Festival, running March 8 -10. The four day Festival includes two full-length films, an evening of shorts, indie music, a morning event of short films for kids, an evening of rock music, and then more music at the After Parties (which are sponsored by Tullamore Dew and Heineken). It’s the Craic Festival, not the High Art Festival—and it’s always a party. The music includes some of the best of Irish indie rock—including hip-hoppers the Rubberbandits and John Gribbin. The films include two uplifting features and an evening of shorts. Parked tells the story of Fred Daly, who lives in his car. Starring Colm Meaney (Get Him to the Greek; The Snapper; Star Trek: Next Generation and Deep Space Nine), it is the story of his friendship with his “neighbor,” a 21-year old man named Cathal. The film, which opens the Festival, was a Galway Film Fleadh winner (and also had an outing in Irish Film NewYork, curated by Niall McKay, in October). Terence describes the film as a “metaphor,” of someone who is stuck. “There’s a sense of optimism and hope in the film that I think we haven’t seen in many years,” he says. Meany is scheduled to appear on the opening of the Festival. His fans will see a different side of him, Terence says. Description and video after the jump! Friday night will be an evening of short films. Ireland’s done very well with the short films recently: “Pentecost” byPeter McDonald and “The Shore” by Northern Irish Terry George are both nominated for Academy Awards. “We wanted to shake it up a little,” Terence explains. “So it’s the Best Of, and an After Party at Tribeca Cinema.” That night also launches the musical evening “Belfast Rocks,” which includes a number of performers, headlined by Duke Special (Peter Wilson), a Belfast performer described as a “vaudeville” type artist who uses a variety of intstruments, including a gramophone, onstage. Other performers that night include singer John Gribbin, RAMS Pocket Radio, and TheClatty Lads. The Clatty Lads are actually Irish-American, like Terence, but they have Belfast roots. Rubberbandits are a hip-op pair from Limerick made up of Blindboy Boat Club and Mr. Chrome. Theatrical and satirical as well as musical, the duo has performed on RTÉ, MTV, were voted “Best Irish Act” 2011 at the entertainment.ie awards. Terence booked them after seeing their 2010 video “Horse Outside,” which within 72 hours of its release was the top rated YouTube video in Ireland. “You have to see them live,” says Terence. Dublin rockers The Minutes are also selling “big venues in Ireland,” says Terence, and going to the famous music festival South bySouthwest. The closing night film, In Sunshine or in Shadow, is also a film about hope. 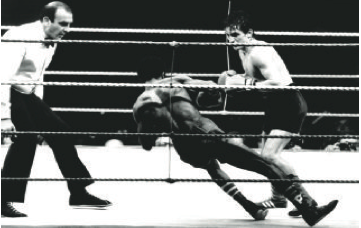 It tells the story of boxing champ Barry McGuigan, who won the featherweight title match against Eusebio Pedroza in 1985. His Irish-American roots pushed Terence to start the Festival in the first place. He was an actor and an MC at the New York Comedy Club, and he wanted to connect with his heritage. The films will be shown at Tribeca Cinemas; After-Parties and Music will be held there and at the Mercury Lounge. Check the Craic’s website for details. Warning: the “Horse Outside” video makes liberal use of the F-Bomb. But it’s hilarious.